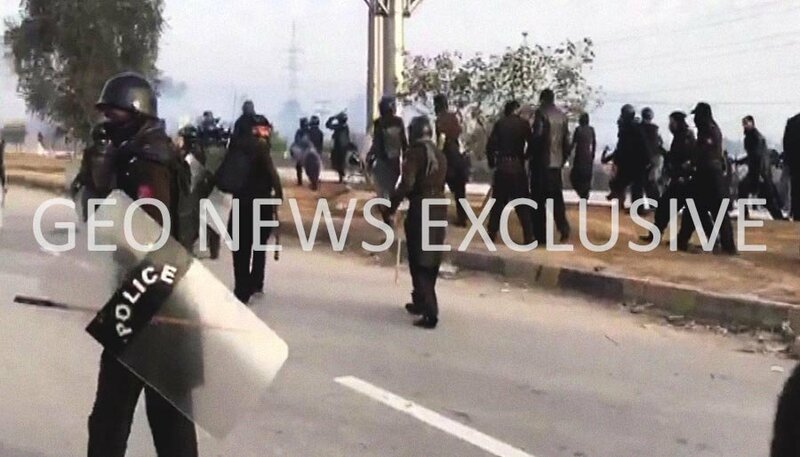 ISLAMABAD: Rangers have taken forward positions at and around Faizabad interchange as protests continue in the capital and other cities on Sunday, a day after authorities launched an operation to disperse the protesters. 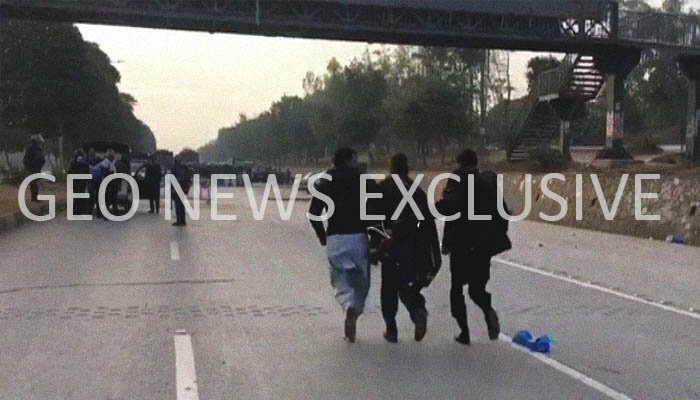 Security arrangements for the operation have now been handed over to the Rangers to keep the law and order situation in the federal capital under control, sources said. 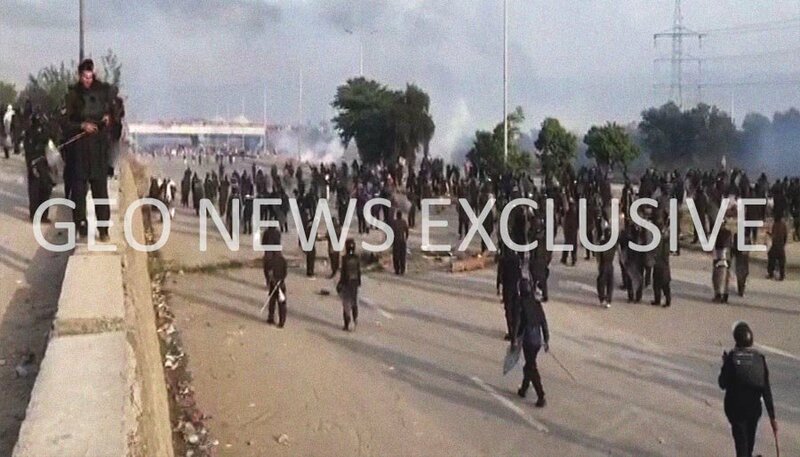 The operation, which commenced on Saturday to disperse protesters at the interchange, was suspended at approximately 2:30 PM local time. Protesters renewed violence early Sunday morning as they resorted to arson and pelted stones at police. 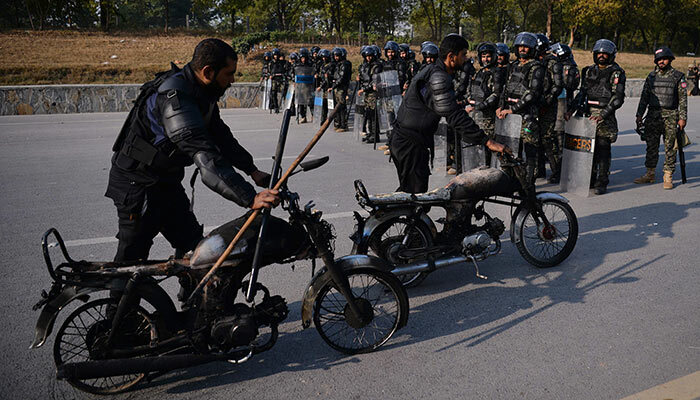 The protesters began pelting stones at policemen and set fire to five motorcycles and a car belonging to the police near I-8 sector earlier today, police said. 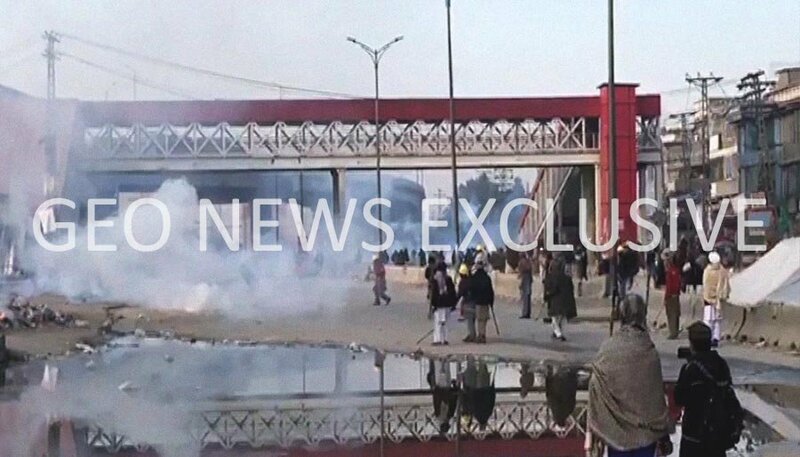 The situation remains tense in the capital as demonstrations continue at Faizabad interchange, I-8 Markaz and other areas. 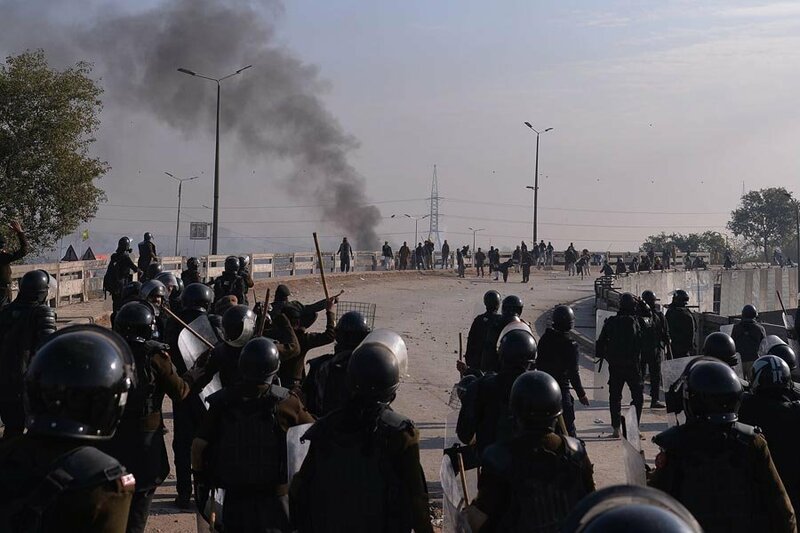 Express Highway, IJP Road, and the motorway leading to Lahore remain closed to traffic. 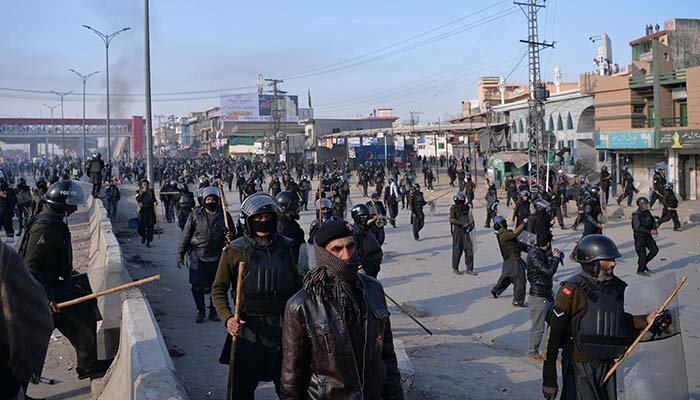 On Saturday, a protester was killed while over 250 people including 90 policemen and FC personnel, as protests, took a violent turn in the capital. Around 8,000 security officials took part in the operation aimed at dispersing the protesters with the help of tear gas and water cannons. News channels across Pakistan were restored 28 hours after they were taken off air at the behest of the Pakistan Electronic Media Regulatory Authority (PEMRA) on Sunday. The regulatory body had ordered the restoration of all news channels on Sunday after the Ministry of Information, Broadcasting, National History & Literary Heritage had written a letter to PEMRA to withdraw its earlier directives. 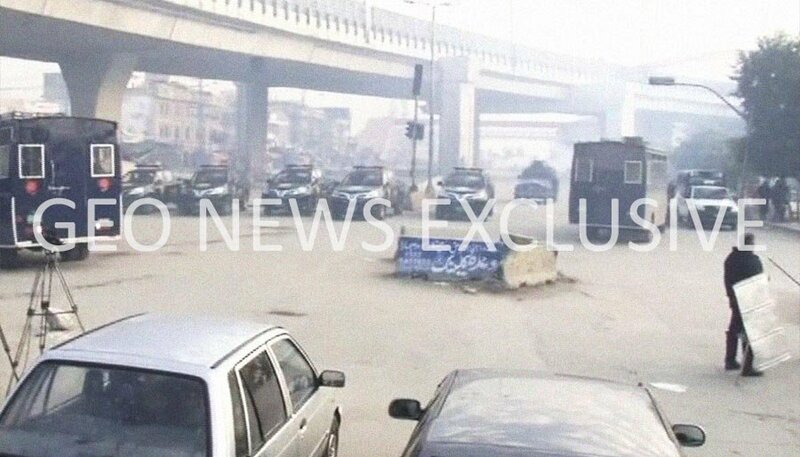 The government has tasked DG Rangers Punjab Major General Azhar Naveed Hayat with bringing the situation at Faizabad interchange under control. The Ministry of Interior also notified General Hayat's appointment as in-charge of the operation Sunday evening. Pakistan Telecommunication Authority (PTA) ordered the restoration of social media platforms — including Facebook, Twitter, and YouTube — on Sunday evening. Some websites, including live streaming of news channels, were blocked at the behest of authorities across the country since Saturday. 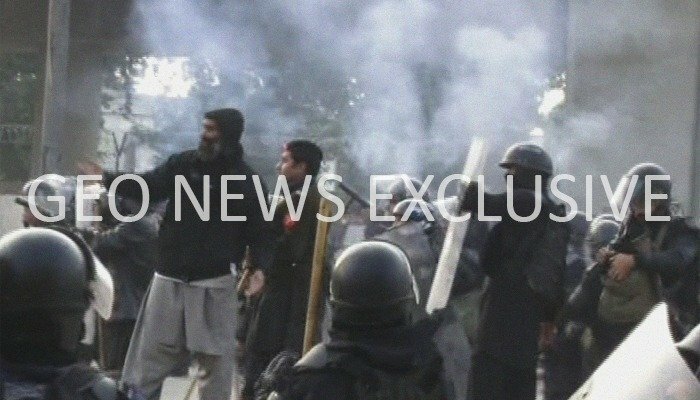 Prime Minister Shahid Khaqan Abbasi and Chief of Army Staff General Qamar Javed Bajwa agreed that force will not be used to disperse protesters in Islamabad during a high-level meeting on Sunday, sources told Geo News. During the meeting, the two officials exchanged views on the matter and tried to formulate a plan of action. 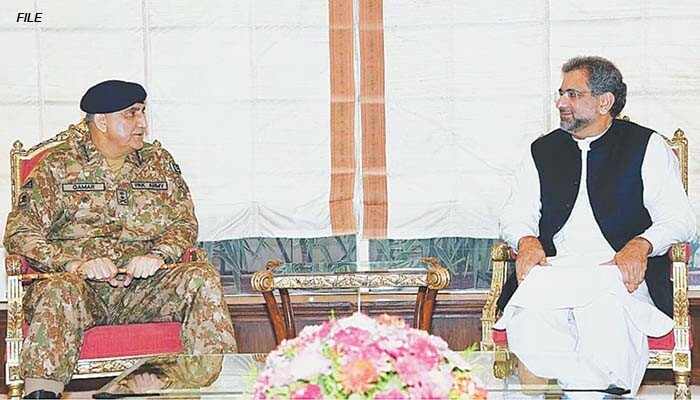 The two officials discussed the issue of whether firearms should be used by army personnel. The COAS affirmed that that the army will act according to the law and Constitution of the country, sources added. Both officials agreed that the issue should be resolved in a peaceful manner. The COAS also expressed concern over restrictions placed on TV news channels and suggested that the prohibition be removed, sources said. The army chief also suggested that the findings of the Raja Zafar-ul-Haq committee should be made public. The army chief was on a visit to the United Arab Emirates and cut short his trip to reach the country last night, sources said. General Qamar Javed Bajwa also spoke with Prime Minister Abbasi regarding the sit-in in Islamabad on Saturday. “COAS telephoned PM. 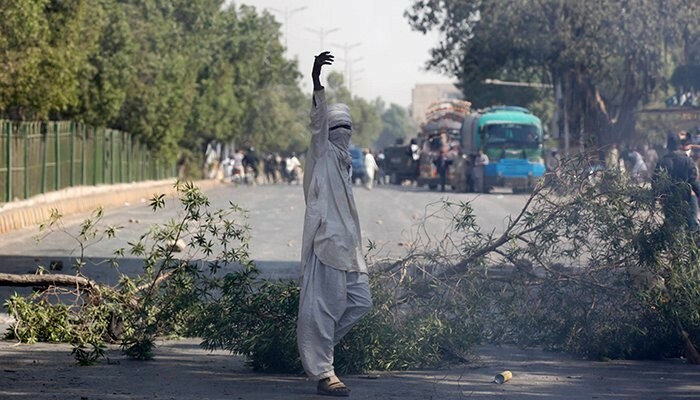 Suggested to handle Isb Dharna peacefully avoiding violence from both sides as it is not in national interest and cohesion,” Major General Asif Ghafoor — the director-general of the Inter-Services Public Relations (ISPR) — tweeted on Saturday. The Pakistan Electronic Media Regulatory Authority (PEMRA) on Sunday ordered the restoration of all news channels. The regulatory body had ordered to take all news channels off air on Saturday. 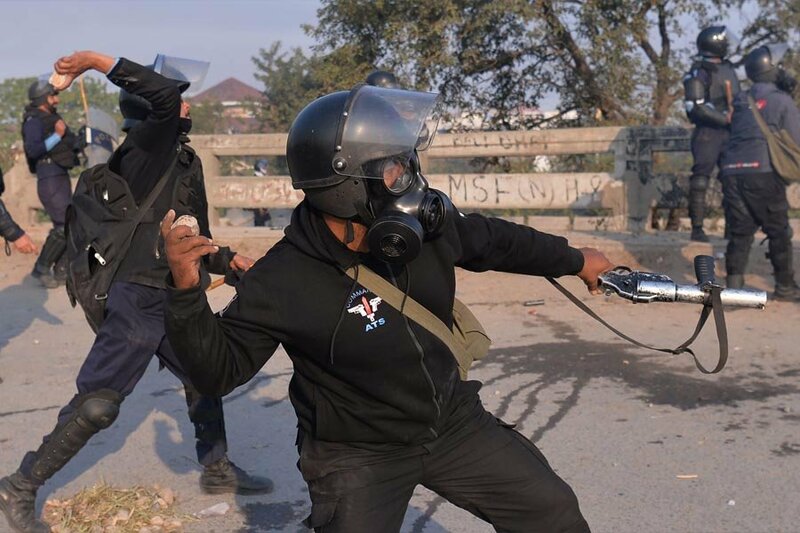 It had earlier barred media from live coverage of the Islamabad Operation under Media Code of Conduct 2015. Prime Minister Shahid Khaqan Abbasi chaired a high-level meeting to evolve a strategy to tackle the situation in the federal capital and other parts of the country following the launch of Islamabad operation. The meeting was attended by Punjab Chief Minister Shehbaz Sharif, Interior Minister Ahsan Iqbal along with district administration and police officials from the twin cities. Earlier, PM Abbasi and CM Shehbaz met to discuss the situation and deliberated over ways to achieve a peaceful resolution. The two are also expected to meet with the military leadership of the country. 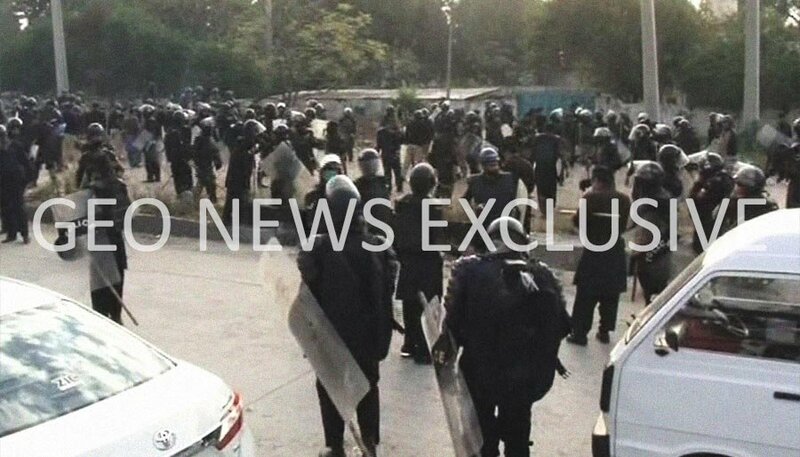 The Ministry of Interior issued on Saturday night a statutory regulatory order (SRO) to authorize the deployment of the Pakistan Army to aid civil power to control the law and order situation in the Islamabad Capital Territory. The SRO — issued in light of the request of the Islamabad Capital Territory Islamabad Administration, dated November 25, issued by the ministry under Article 245 of the Constitution, read along with Sections 4 and 5 of the Anti-Terrorism Act and section 131-A of the Cr.P.C — authorized "the deployment of sufficient number of troops" as "to be determined by the Commander 111 Brigade" in effect from November 25 until further orders. Sources said Prime Minister Shahid Khaqan Abbasi took the decision to summon the Army and the interior ministry issued the notification after the premier's approval. In response, however, the Pakistan Army said while its troops are "fully ready to perform the assigned task in line with its institutional obligations", there are "few aspects meriting deliberation prior to [the deployment". The police force "has not been optimally utilized to its full capability" in "dealing with [the] protesters", the Army noted. In addition, "Pakistan Rangers, backing […] police as 2nd tier force physically deployed with police in Islamabad, have not been given written instructions as agreed for their employment." The Army added that its troops are "traditionally not just used for dispersal of crowd/protesters but to quell commotion". Therefore, their deployment "needs to be clarified in the context of item 6 of Supreme Court judgment dated November 23, 2017, with regards to civil petition no 2983 of 2016 (Sher Jamal and others vs Wali Sardar and others)". Also, the Islamabad High Court (IHC) "restrains [the] use of 'firearms' during clearance operation", as per Item 8 of its "judgment of writ petition number 3914 of 2017". A letter dated November 24, written by Islamabad District Magistrate and addressed to the Sector Commander of Rangers, has come to light revealing that Rangers' presence had been requested during the Islamabad sit-in to deal with any eventuality. 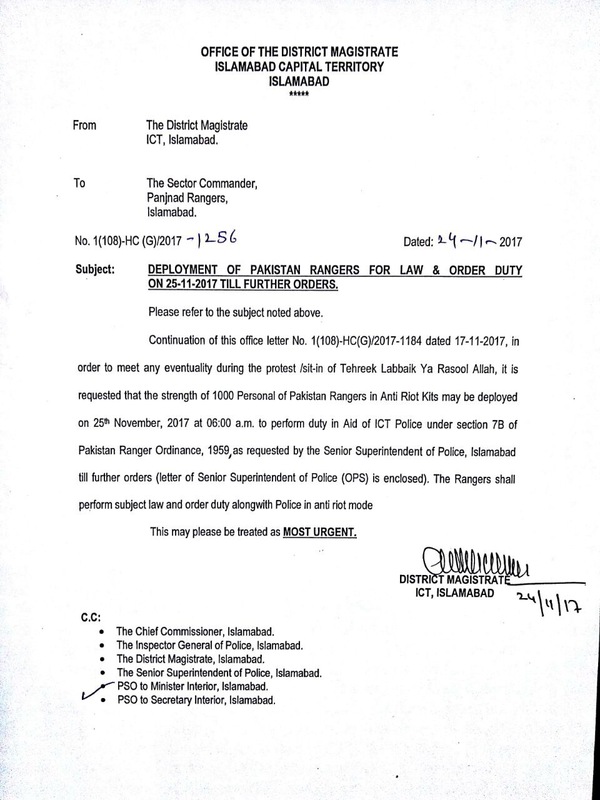 "...in order to meet any eventuality during the protest/sit-in.., it is requested that the strength of 1000 personnel of Pakistan Rangers in Anti Riot Kits may be deployed on 25th November, 2017 at 06:00am to perform duty in aid of ICT Police...." the letter stated. Earlier on Saturday, Directorate MO had claimed that Rangers had not been summoned to assist with the operation. 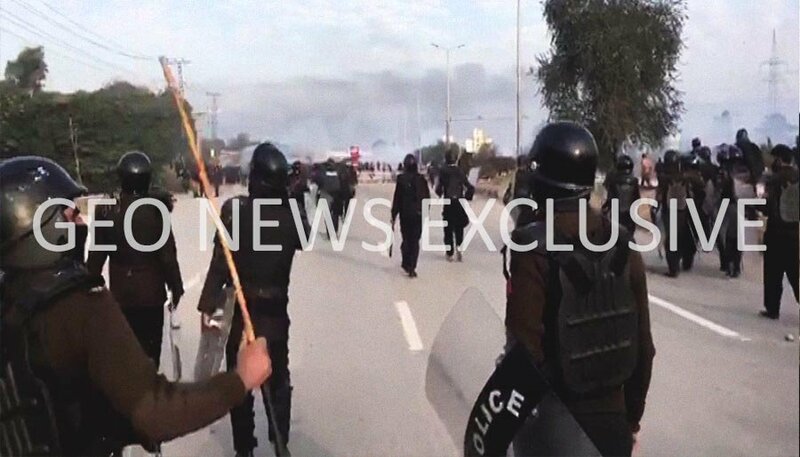 Minister of Interior Ahsan Iqbal chaired a meeting Saturday night on the situation at Faizabad, sources said. 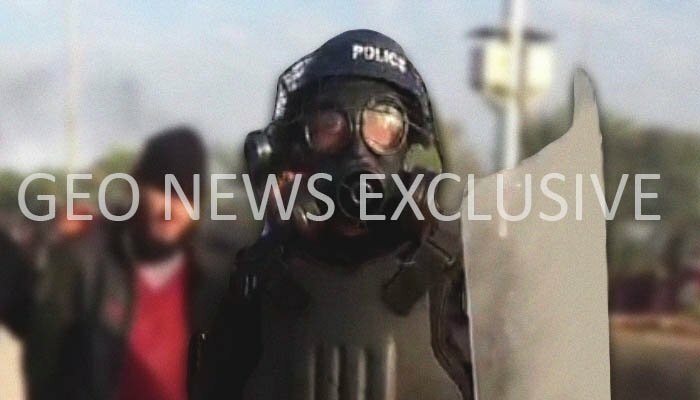 According to sources, the Islamabad administration and police have resisted conducting another operation during the meeting, which lasted more than two hours without a decision being reached. Sources added that Iqbal will consult Abbasi if a decision was not reached during the meeting. The chief commissioner of Islamabad, IG police, district commissioner, and others attended the meeting. Earlier, the protesters demanded that the entire federal cabinet resign and said no one will present demands on their behalf. They also said their committee will make a decision on negotiations and added that the administration of Islamabad and Rawalpindi will be responsible for their actions. Interior Minister Ahsan Iqbal said Saturday afternoon the operation was being conducted on the IHC's directives and added that the court had ordered to end the sit-in in three days. Iqbal stated that the government is willing to conduct negotiations at any time and appealed to the people to not cause chaos since it plays into the hand of international conspiracies against the country. The interior minister added that the security forces and administration are trying to ensure minimum loss. 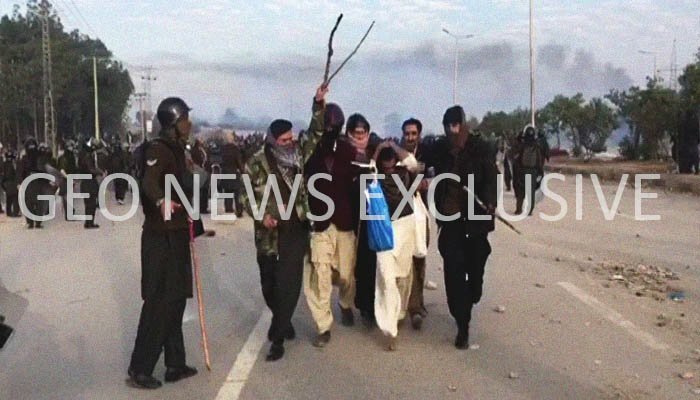 Protesters attacked and entered the residence of federal Minister for Law and Justice Zahid Hamid in Pasrur. At the time of the attack, the law minister and his family were not in the house. The protesters of the religious parties have demanded the resignation of Hamid and have refused to negotiate till their demand is met. 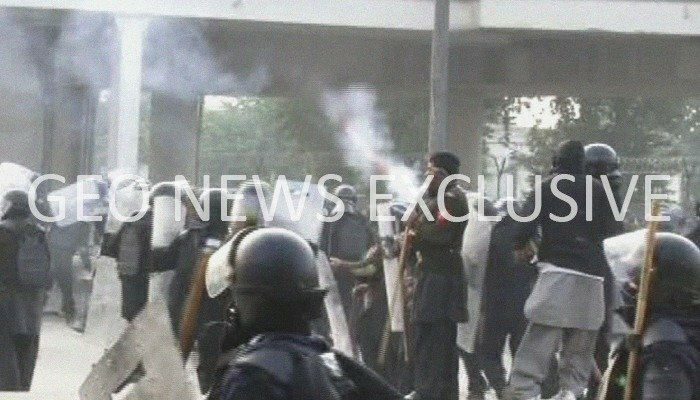 Demonstrators also entered former Interior Minister Chaudhry Nisar's residence and set fire to the gate. However, he and his family were not at their residence at the time of the incident. 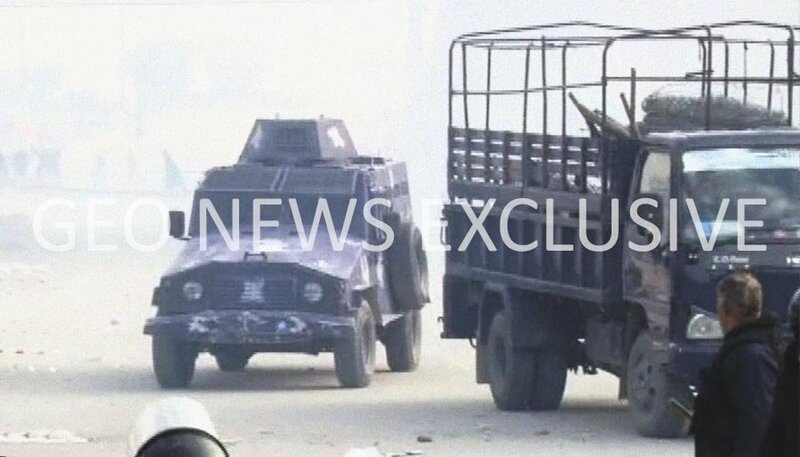 Nisar was subsequently shifted to a secure location in an armoured personnel carrier and police were deployed at his residence to safeguard it from any violence. However, Nisar's spokesman denied that he had left the residence in an armoured vehicle and had already moved to Islamabad a week earlier. A building and a mobile satellite van located near Nisar's residence was also set ablaze. Condemning the attack, opposition leader Khursheed Shah said attacking someone's home to force them to agree to demands is not part of Islam's teachings. Whether it be the home of a minister or a civilian, respect is necessary, Shah stated, adding that leaders of religious parties should ask their workers to refrain from extremist measures. 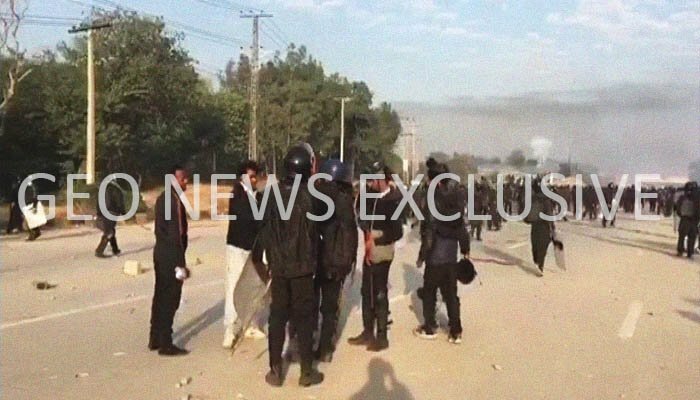 Javed Latif — a member of the National Assembly (MNA) — was injured by protesters after he had gone to negotiate on behalf of the government. "We did not want to take action against the protesters and went to negotiate. I ask God to show [the protesters] the right path," said Latif. Latif claimed his dera was also attacked by unidentified men and five of his workers were injured. 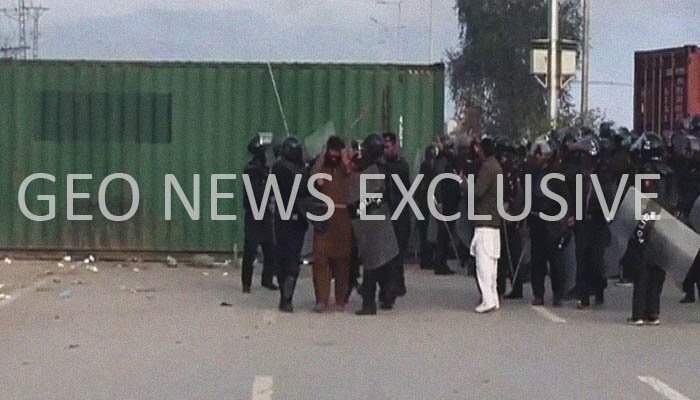 However, police said the MNA's house was not attacked. 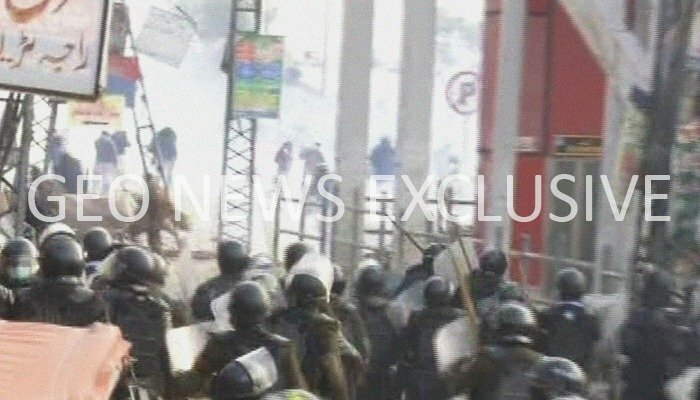 Media personnel covering the protests across the country came under attack in various cities. 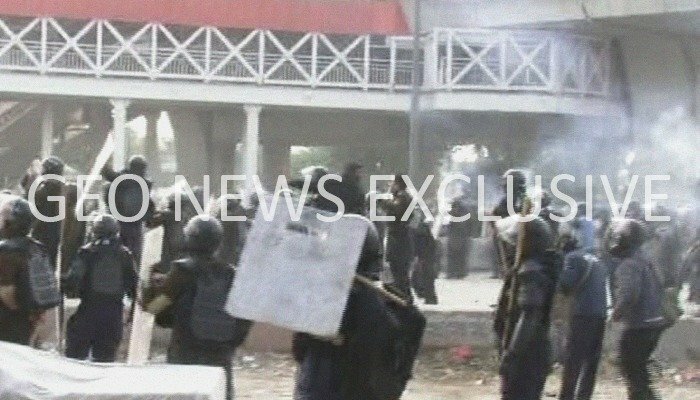 In Islamabad, a private channel's DSNG van was set on fire, while in Karachi, Geo News' team members were assaulted by protesters. 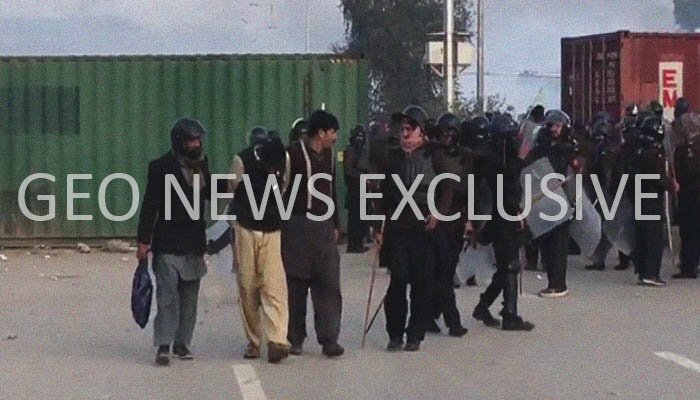 Geo News' correspondents Talha Hashmi and Tariq Abul Hasan were injured. 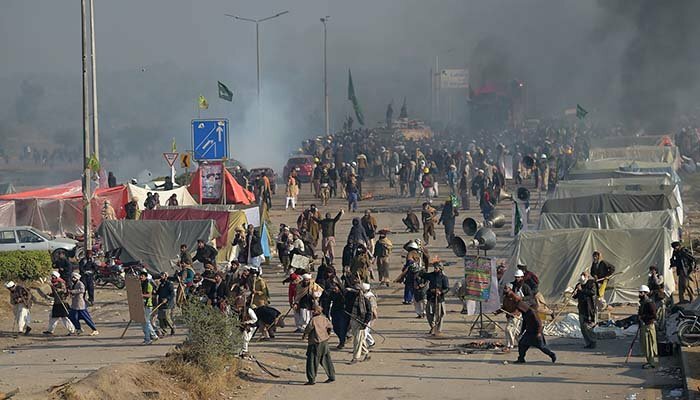 The Pakistan Broadcast Association (PBA) condemned the attacks on members of the media during the coverage of the religious party's protests across the country. In a press release issued Saturday, the association said violence against journalists and attacks on media vehicles will not be tolerated. Protection of journalists is the responsibility of the state, the PBA said, demanding that the government take action against those who are violating laws. The association condemned the burning down of a private channel's DSNG van in Faizabad, attacks on Geo News’ reporters in Karachi and two DSNGs in Lahore. 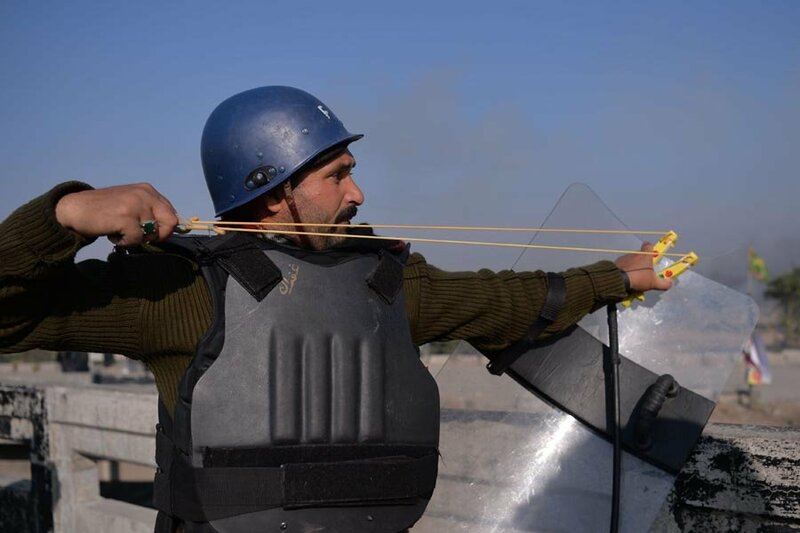 PBA also urged journalists to take all necessary safety precautions while performing their duties. The operation commenced on court orders following the expiry of the midnight deadline set by the district administration on Saturday. Around 8,000 security officials were part of the operation, including 3,000 FC personnel. 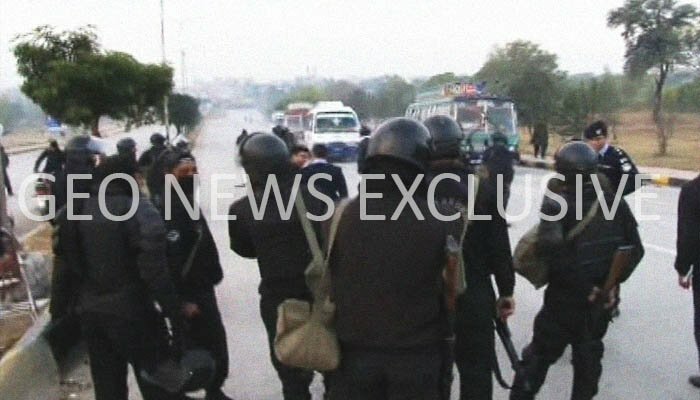 At least 250 people, including 90 policemen and FC personnel, were injured in the operation and admitted to different hospitals in the twin cities. 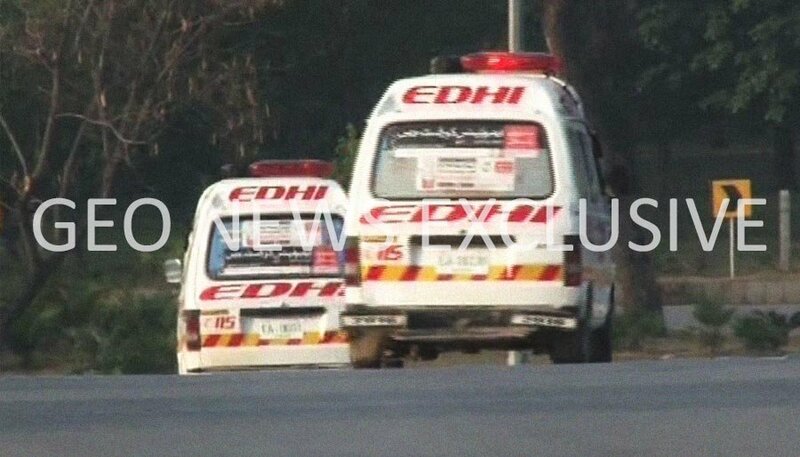 Of these, 190 of the wounded were brought in to PIMS Hospital for treatment throughout the day, a spokesperson for the facility revealed. 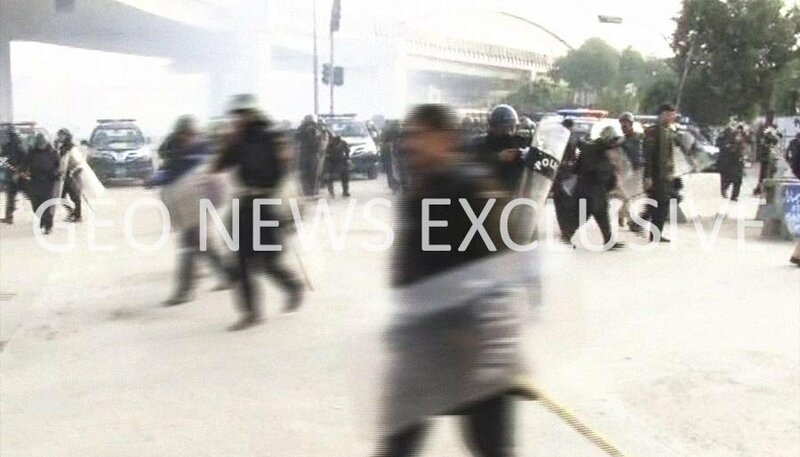 The injured people at PIMS comprised 73 and 64 officers of the police and FC, respectively, as well as 53 civilians, the spokesperson stated, adding that 60 wounded are currently under treatment. On the other hand, 18 injured people were taken to Polyclinic and more than 50 were taken to the Benazir Bhutto Hospital. 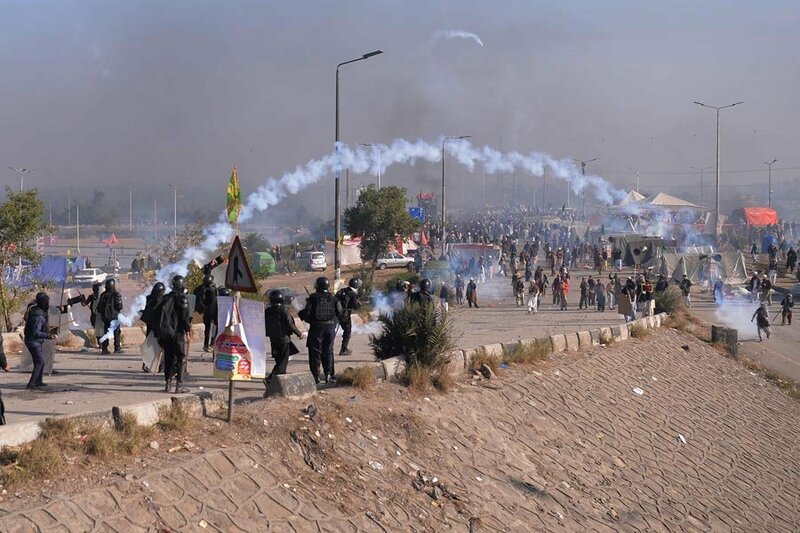 Security officials conducted the operation against the protesters from five directions: Khanna Pul, GT Road, Islamabad Club Road, Express Highway, and Murree Road. 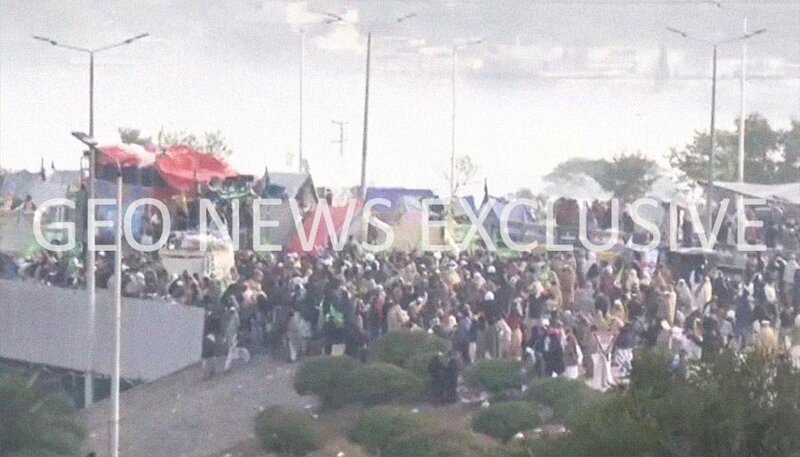 Protesters had blocked Bhara Kahu leading to Murree, Rawalpindi Expressway, and the Motorway. They also set fire to ten police vehicles in the area. Electricity and internet services in and around Faizabad were suspended. 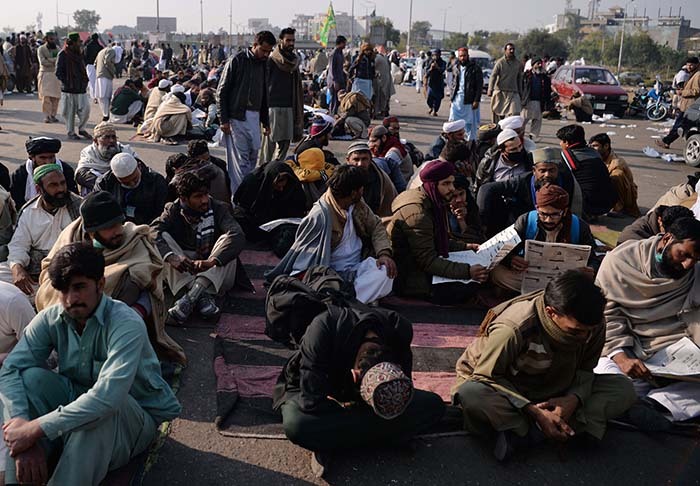 Minutes before the operation started, the law enforcement agencies (LEAs) removed the barbed wire fences, which had surrounded the sit-in area, where protestors belonging to a religious party had been demonstrating for 20 days. The Pakistan Electronic Media Regulatory Authority (PEMRA) also ordered to take all news channels off air on Saturday. Following the directives, news channels were reported to be off the air in parts of the country. Earlier, PEMRA had barred media from live coverage of Islamabad operation under Media Code of Conduct 2015. The regulatory body had instructed media houses to ensure the security of their staff while the situation persists. 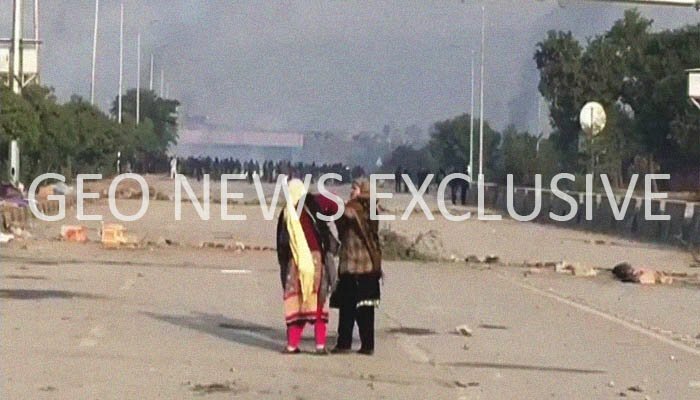 Besides Islamabad, protestors and LEAs' officials are facing off in Karachi, Lahore, Faisalabad, Gujranwala, and Sambrial in Sialkot district. 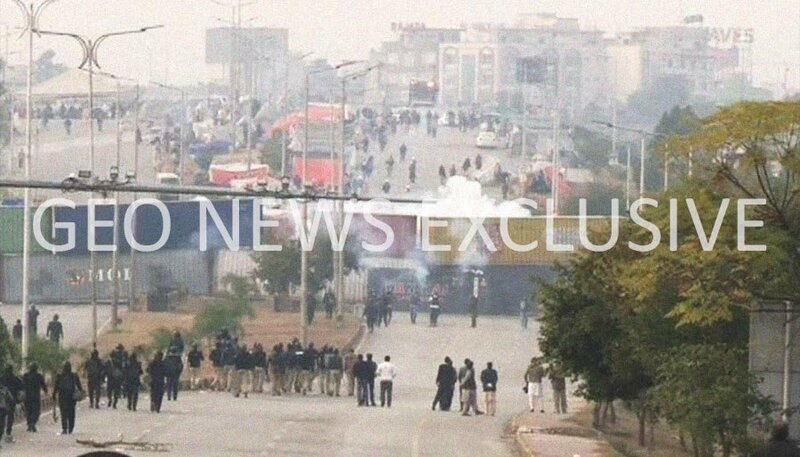 In Karachi, sit-ins by a religious group continued for second day against security forces operation in Islamabad. 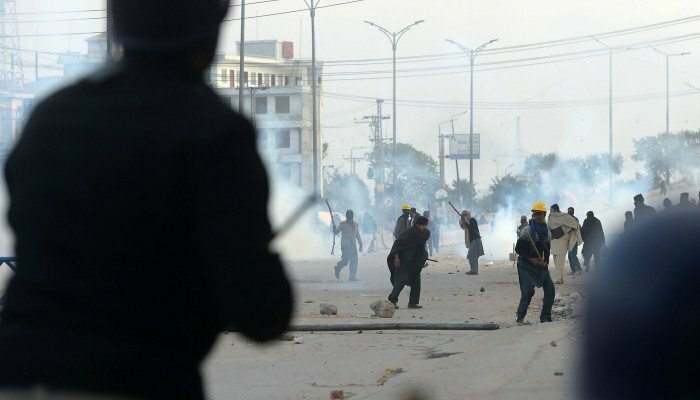 Protesters have occupied 10 different areas of the city, including Numaish Chowrangi, Tower, Al-Asif Square, Orangi, Landhi and Hub River Road. Containers have been placed on the road leading to Governor House as well as the road from Teen Hatti to Jehangir Road. Protesters agreed to open a route from Tower leading to I.I. Chundrigar Road after talks with Rangers, after which traffic flow from Saddar to I.I. Chundrigar was back to normal. 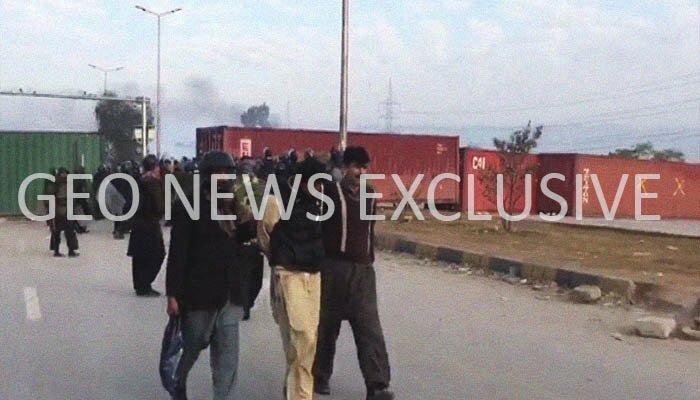 Protesters and workers of religious parties also continued their protest in Lahore. 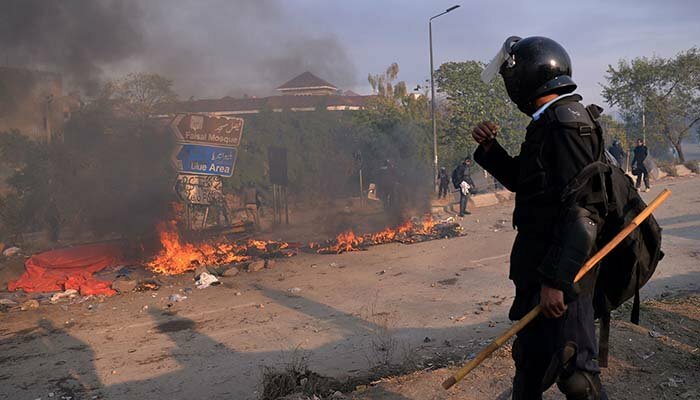 With conditions tense throughout the city, sit-ins persist at more than four locations — Thokar Niaz Beg, Babu Sabu Interchange (Sadequain Interchange), Begum Kot, and Shahdara Morr — while Charing Cross and Mall Road remain blocked by the demonstrators. Metro bus services in Lahore, Multan and Rawalpindi have been suspended today as well. 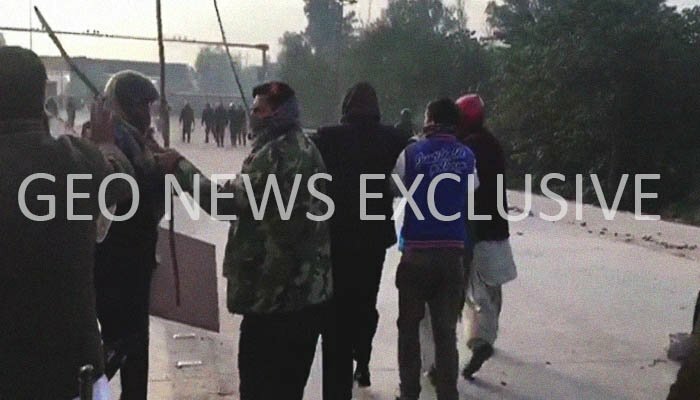 In view of the situation, all educational institutes in the province will remain closed for two days (on Monday and Tuesday), Punjab government announced on Sunday. 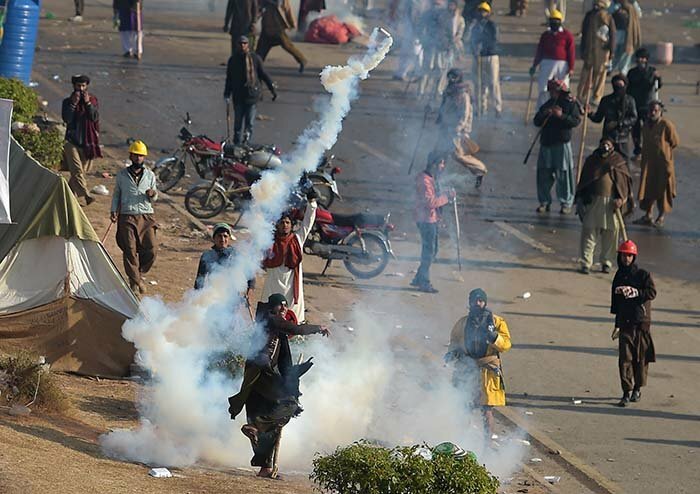 Protests held in Sindh, Punjab and Khyber Pakhtunkhwa resulted in at least one death and left dozens injured, besides the 250 injuries reported in Islamabad.